Waseem, baadameee? Why would you invite a illiterate RAW agent to ur show? Your producer is ANTI PAKISTAN. What this PIG has to say? That will benefit animal kind? Stop giving terrorist sympathizers platform. This man is our so-called religious scholar. Though Islam prohibits corruption but for this man, it is a non-issue. I guess the only Islamic for him is to vote for these crooks who use the religion for their personal gains. This is the ideology of PMLN, PPP and JUIF leadership. Shame on them. Their followers should realize that the leadership is teaching them to shun the very basics of morality. His father said, Shukar hai hum Pakistan banaey ke gunah mein shamil nahin they. What else you can expect from him. Part of it himself, that is why. Fazloo a so called religious leader is endorsing corruption,theft and cheating instead of condemning them. Naan aur Halwaa asal issue hai iss besharam ka. I feel pity for those who consider this low life an Aalim e Deen. Nahoosatt tappak rahi hai.....phittkaaar teri shakal pe.....manhoooos aadmi...!!! Hamein bachpan mein islamiat mein aik Hadeeth parhai jati thi key corruption lene and deney wala dunoon jahannami hein...............this FAT pig doesn't know about that?? 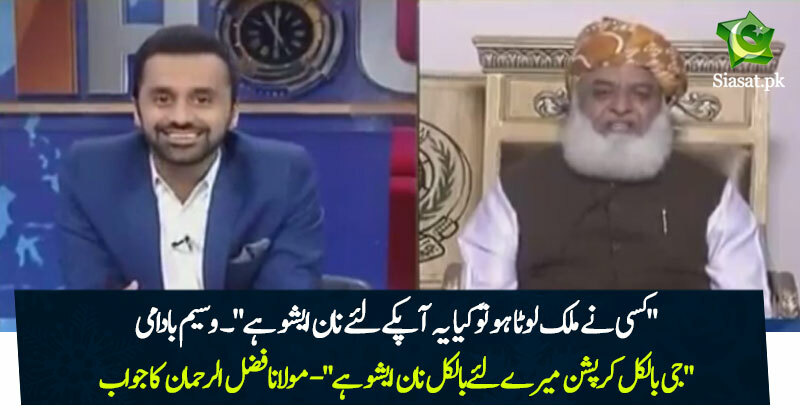 Despite I hate Moulana Fazal but what he is saying is what PTI is acting on? If Moulana Fazal is corrupt then what actions are taken by PTI against him? AIk bay ghar kuttay keliye yeh kehna ke kaun acha khana deta hai should be a non issue, all he needs is CHECHRA / HADDI who ever throws he will salaam that person and party, what they do , how they live, how they make their living is not his concerns, he can be pimp of any one and every one as long as he get some thing from them.